A relatively new image from NASA shows that the skiing would be relatively descent on Mars. At this time of year, only south-facing slopes retain the frost, while the north-facing slopes have melted. Gullies are not the only active geologic process going on here. A small crater is visible at the bottom of the slope. Conditions on Mars — low temperatures and low atmospheric pressure — do not allow water to exist in liquid form in open reservoirs as it would on Earth. 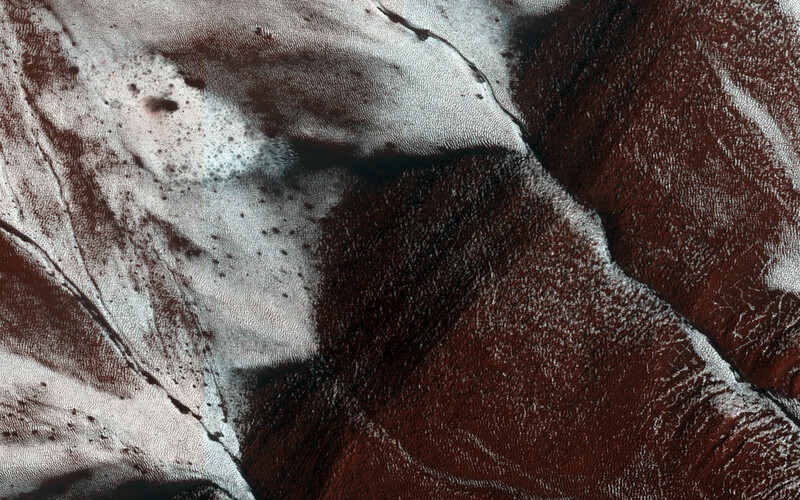 However, on Mars, there is a powerful layer of permafrost, with large reserves of frozen water concentrated at the polar caps. There is water vapour in the atmosphere, although at very low levels compared to the quantities experienced hereon Earth. If the entire volume of water in the atmosphere was to be spread evenly over the surface of the planet, the thickness of the water layer would not exceed 10-20 microns, while on Earth such a layer would be thousands of times thicker. The image was acquired on November 30, 2014, by the High Resolution Imaging Science Experiment (HiRISE) camera, one of six instruments on NASA’s Mars Reconnaissance Orbiter. The University of Arizona, Tucson, operates HiRISE, which was built by Ball Aerospace & Technologies Corp., Boulder, Colorado. NASA’s Jet Propulsion Laboratory, a division of the California Institute of Technology in Pasadena, manages the Mars Reconnaissance Orbiter Project for NASA’s Science Mission Directorate, Washington.